Everybody's acting weird, especially the faculty. The Baby Boom Echo, the segment of the population currently under the age of twenty, comprises thirty per cent of the North American population, and their numbers are expected to continue growing well into the first few years of the new Millennium. With such a large demographic group moving into their prime spending years, Hollywood producers have been re-jigging their products in order to capture the hearts, minds, and discretionary income of the Baby Boom Echo. "The Faculty" is the latest attempt at a 'high (school) concept' filmmaking-- this time it's "Invasion of the Body Snatchers" set in a high school. 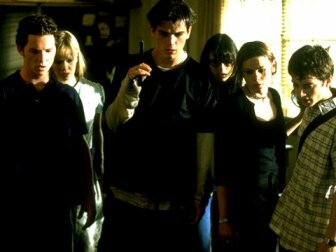 And while "The Faculty" unites two of the more illustrious people in Hollywood today, horror screenwriter Kevin Williamson ("Scream", "Scream 2", and "I Know What You Did Last Summer") and John-Woo-school-of-filmmaking director Robert Rodriguez ("El Mariachi", "Desperado", and "From Dusk 'til Dawn"), their combined abilities are not able to save this passable sci-fi thriller. Why do you rag on me so much? Because it's your fate... you're the geeky Stephen King kid that's in every school. Like your typical teen drama, "The Faculty" fills out its cast with several good-looking representatives of the high school social hierarchy. Casey (Elijah Wood of "Deep Impact") is the introverted geek who is picked on by the jocks and ignored by everyone else. Stan (Shawn Hatosy of "The Postman") is the squeaky-clean captain of the football team. Zeke (Josh Hartnett of "Halloween H20: Twenty Years Later") is a genius who devotes his efforts to dealing drugs instead of getting good grades. Delilah (Jordana Brewster) is the ravishing head cheerleader and editor of the school newspaper. And rounding out this cross-section of high school life are Stokely (Clea Duvall), the dour goth girl that nobody likes, and Marybeth (Laura Harris), the cute-as-a-button Southern belle who just transferred in. I didn't know you were a lesbian. I've never met one before. Have you been out long? At first, these six students have very little in common, and go about their day-to-day routines, trying best not to stray too far outside their prescribed clique. However, they all begin to notice that something is rotten in the halls of Herrington High. Casey finds an odd-looking seed pod in the middle of the football field, which is unlike anything anyone has ever seen before. Even more disturbing, some of the teachers begin to act strange, starting with the football coach (Robert Patrick of "Cop Land"), the principal (Bebe Neuwirth), and the school librarian (Piper Laurie of "Twin Peaks"). You're not into sports much, are you? I don't think a person should be running unless they're being chased. Pretty soon, the entire faculty is acting strangely, and students are being told to report to the school nurse (Salma Hayek of "From Dusk 'Til Dawn") for a 'checkup'-- a checkup in which they emerge a 'changed' person. Using old science fiction movies as the basis for their intellectual insights, the six students become convinced that Herrington High is ground zero for an alien invasion, and that they are the last line of defense against the complete enslavement of mankind (no, seriously). Of course, nobody believes them. Even worse, with most of their friends and neighbors under alien influence, they do not know whom they can trust... even amongst themselves. Something's happening to the teachers at school. While "The Faculty" does have its share of edge-of-your-seat moments, albeit few-and-far-between, it is a lackluster effort overall. Filled with gaping plot holes, illogical plot twists, and gratuitous violence for the sake of gratuitous violence, watching "The Faculty" never rises above its 'me-too' trappings. Furthermore, the film's self-referential humor, a hallmark of a Williamson-penned script, is awkwardly inserted and falls flat on delivery-- a far cry from the smart and savvy material that Williamson penned for "Scream" and "Scream 2". Look, we love you son. We want to help you. I want you to believe me! So members of the burgeoning Baby Boom Echo demographic (and you know who you are), save your money and rent the Don Siegel-directed "Invasion of the Body Snatchers" from 1956 instead. "The Faculty" may have better-looking actors, but it is a pale imitation to the original. Images courtesy of Dimension Films. All rights reserved.